To rescue a pig in need is always a worthwhile cause. Always. However, dedicating one’s life to rescue does take a toll. There are many challenges to be met on a daily basis as well as long term. The hardships of rescue may be overwhelming at times. If you are thinking of opening a rescue or sanctuary, consider these challenges. Consider them long and hard. Everyone with a spark to save a pig should absolutely use that passion to help. Always remember to prioritize the best interest of the pig and always take care of yourself. You will not be helping the pigs if you take on a great burden that you cannot maintain. You will not be helping the pigs if you burn out or run out of financial assistance. Taking on too many pigs will end up putting them in the same state of neglect that you may have rescued them from. If you are considering supporting a rescue or sanctuary, pay close attention to these hardships. These rescuers are dedicated their heart and soul to the pigs. They are sacrificing everything to help the discarded pigs. They give a voice to the voiceless. They feed the hungry. They love the lonely. Please support them in any way you can. Even a kind note or an afternoon of scooping poop will mean the world to them. Rescue stories are often about successes. Lives saved. Making a difference in the world and proud of it! The lesser talked about is the immense guilt that rescuers encounter on a regular basis. The pigs that are not saved. The lives that are lost, right out of our grasp. Sometimes we don’t get to the phone in time and the pig is given away to the wrong hands or the shelter euthanizes. Sometimes a transport volunteer cannot be found. Or funds cannot be raised. Pigs get injured or sick and die. Or there is absolutely no space to put the pig. Sometimes a pig is taken in that is beyond saving (health). Sometimes the home we thought to be a dream come true for this pig…. Isn’t. In the most horrible way. The list of reasons go on and on a mile long. The recurring theme, is guilt. Every rescuer will be burdened by overwhelming guilt and sadness at times. It is easy to say “I can make room for one more pig.” Of course you would. How could you not?! How about when there’s another. And another. And another. All with a story sadder than the previous. They all need you. They will die without your help. You take them in. Now you have a herd of 20 pigs that will depend on you for the next 20 years or so. These pigs will depend on you for every meal, for every weather comfort, for clean drinking water, for secure fencing, for deworming, hoof trims, tusk trims, temperature checks when they go off their feed, emergency vet trips, the medical bills, to give medication when they need it, to rebuild their barn when it is struck by a tree. The needs of these pigs are now your responsibility. While others will most certainly chime in with offers of help or support, they will come and go. Again and again, the responsibility falls on you. The Rescuer. There comes a time in every rescuers life when they are faced with the aging herd. Whether they intended to provide forever sanctuary or not, they are bound to end up with multiple pigs of their own. Some pigs may be unadoptable or never find the right family. Some may have special needs. Some may just have a special place in the heart of the rescuer. These pigs become the lifelong responsibility of the rescuer. As the pigs mature into their teens they face the same things we do. Painful arthritis, lack of appetite, costly medications, emergency surgery, cancers, ulcers, a whole world of medical conditions, and eventually death. One of the hardest parts of being a rescuer is shepherding your herd over the rainbow bridge. To watch them pass and leave us, one after the other, is no easy feat. Unfortunately, by this point in time, many of the rescuers are aged as well, as they have matured every year along with their rescued pigs. Imagine yourself in 25 years. Will you be able to flip an uncooperative pig for a hoof trim? Restrain a big boy for a tusk trim? Hoist a very ill pig into the vehicle for transport to the vet during emergency hours? Bury them…..? At this point in time you may have 5 pigs, 10 pigs, 20 pigs, or 100 pigs. How will you manage? Who will care of them and finance the care of these left behind if you pass away unexpectedly? Will your spouse be willing and able to take on the full burden physically and financially without you? These long forgotten pigs deserve so much. Can you provide that for their entire lifetime? The financial toll on a rescue or sanctuary is huge. Pigs may be cheap on Craigslist but the maintenance & care add up fast. Healthcare, spays, neuters, deworming, vaccines, medications, food, hoof trimming, tusk trimming, emergency vet visits, fencing, water systems, fans, kiddie pools, vegetables. It all adds up, and it adds up alarmingly fast. The number 1 reason for pig rescues and sanctuaries to fail shortly after starting is financial strain. Far too many are lulled into a feeling of security by crowd fundraisers or support of family, friends, and other funding sources such as grants or donors. Seasoned rescuers will tell you time and time again, these sources of funding dry up fast. People will come and go. Support will come and go. The pigs will be there every day, depending on you. Absolutely never take in a pig unless you can afford his or her lifelong care out of your own pocket. Then, use any and all resources available to save your own money for a rainy day, or for other needs. If you take in pigs assuming others will support, you are playing a dangerous game. Caring for a pet pig or two or five is easy enough. As the numbers grow, so does the time involved. Feeding can take hours on a large sanctuary. Fence maintenance, barn building, cleaning, and caring for special needs becomes very time consuming. Often we think of opening a sanctuary or rescue on a beautiful day. The sun is shining, the birds are chirping, and we imagine ourselves surrounded by pigs that depend on our love and care. The reality is heat exhaustion while caring for many pigs in the summer. Dumping soiled pools. Trekking through snow to feed. Frozen water buckets. Huge rains. Hail. Tornados. Hurricanes. There is no sleeping in or staying out of the weather when you have pigs depending on you. They may choose to stay safely in their barn, but you still have to get to them. Rare!! Most rescues and sanctuaries forget about vacations.. The cost is usually prohibitive because it takes away from funds that are needed to maintain the rescue or sanctuary. It’s hard enough finding someone to care for a pet pig or two. Imagine a whole herd. Do you have someone you trust? Someone that ALL your rescue pigs trust? Someone that can handle the potential emergencies? Volunteers are essential to any rescue or sanctuary. It is usually impossible for any single person to handle all the care and business alone. Even volunteers take work. Screening volunteers is incredibly important. You cannot allow the wrong hands on your rescue pigs or allow a scammer to take advantage and steal. Sometimes the most amazing volunteer is found and you thank your lucky stars. Most times, volunteers come and go. They wax and wane in their commitment. While they may assist and ease some burden at times, ultimately, the responsibility falls back on the rescuer. It’s easy to get caught up in the overwhelming support of others while you are considering opening a rescue or sanctuary. After all, it is the noblest of causes, absolutely selfless, and always to be admired. However, support comes and goes. In the end, you are solely responsible for those lives. The many lives. When the support dries up, where will you be? Will you regret your choice to abandon all to take care of these animals? Illness and emergencies surely hit at the most inopportune times. With a rescue or sanctuary, these emergencies seem to pile upon each other. A foster family’s dog may attack a pig, another needs emergency surgery, funds are low, transport is scarce, communications are misunderstood, and veterinarians are closed. Rescue can be very stressful at times. When it comes to a herd environment, a single contagious illness can spread rapidly and threaten many lives. Bio security must be taken very seriously. Emergency aid and planning is always wise, even though nothing goes according to plan. The never ending pile of paperwork when you have pigs to feed and pens to clean. The liability of failure to provide paperwork can be daunting. If a pig exchanges hands without a surrender form you could have problems. Adoption applications are essential for screening applicants. Adoption contracts protect the pigs. Then there are taxes. Donation receipts. Veterinary bills. Fundraisers must be accounted for and funds used. Recurring bills. Running a rescue or sanctuary requires a huge amount of paperwork that must be safely stored for future needs or questions. Failure to maintain certain records may put your rescue in danger or the pig’s life. It is always a sad day when an adopter returns a pig. Even rescues with the best adoption rates and thoroughly screened adopters will have animals returned at times. Besides being sad, this puts an unplanned strain on the rescue. Suddenly another pen is needed, more feed, and quarantine to prevent transmission of any illness to the other pigs. 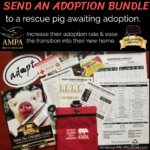 Unlike a shelter pig or an owner surrender, when one of your rescue’s adopted pigs needs a home it is your responsibility to take them back, no matter the strain or inconvenience. While having a pet pig may be a joy that we want to multiply, many rescue pigs will have a difficult time with the adjustment of leaving their family. They may already have bad habits or aggressive behaviors that will need to be dealt with. Additionally, pigs have a pecking order to establish when they are introduced. Bringing new pigs in is always a challenge to your current herd. Some pigs will never get along and will be a constant struggle to keep them at peace or separated. The costs and physical work to setup a sanctuary are overwhelming. However, the long term cost and maintenance are beyond the expectations of most. Barns deteriorate or become damaged. Fences need repaired or replaced often, especially with pigs that test the boundaries. Consider caring for a large number of animals for the next 20 or 40 years. There is no light at the end of the tunnel. There is no end. There is no finish line. There is no saving them all. No matter what you do, no matter how many you save, no matter how much you sacrifice, your heart will be broken at the many that are turned away or not saved in time. Rescue is rewarding and absolutely heart wrenching. If you want to open a rescue because it makes you feel good, you need to consider the endless pain and suffering you will encounter. It’s a terrible helpless feeling when you have absolutely no more to give, while lives are at stake.